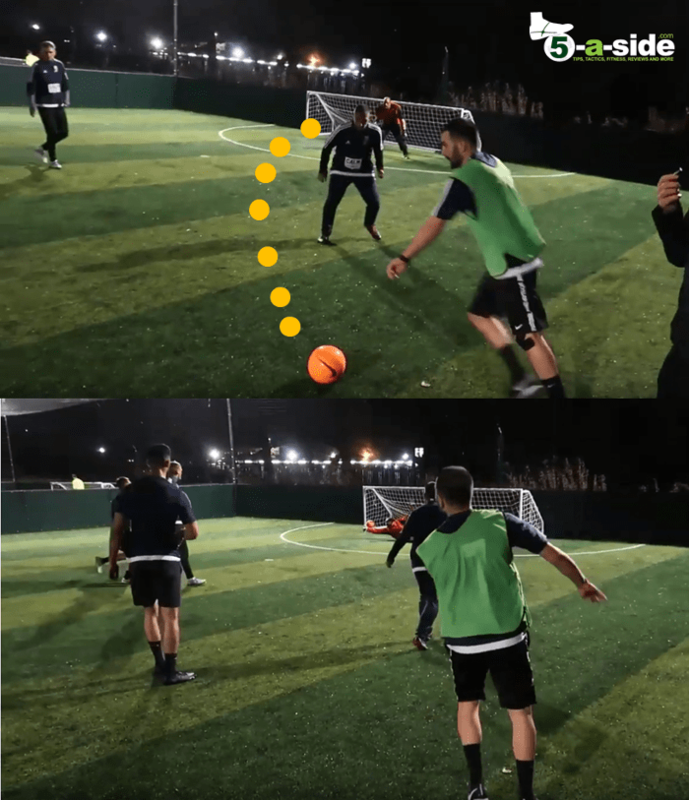 Filmed in November 2018, at Trent Park Football, this game saw two top 5-a-side teams go at it in the chance to win £500. In a competition organised by Roger “the Cat” Noveall (legend goalkeeper of the 5-a-side world), Pro Evo played off against Sunny Beach (in the bibs). Both teams had plenty of quality, and after a cagey first half the game really started to open up. It was a freezing winter night and I could barely feel my hands by the end of the game. But the chilly fingers were worth it, and hopefully you enjoy watching it. A few things really stood out to me throughout the game, both tactically and technically. Perhaps we’ll make these into a separate analysis video (if you think you’d be interested in that, comment below and I’ll see what I can do). Sunny Beach (the team in bibs) often struggled in possession of the ball and a big part of that was the lack of depth that they had. Here’s a picture that illustrated it nicely. They’re in possession of the ball, but 3 of the 4 players (No. 2, 3, and 4) are almost in a line across the half way point of the pitch. None of the players are looking to make a forward run, and player 1 is providing the only depth on the team but only going backwards. If you play like this then it makes it much easier for the defending team to deal with. Essentially they’re restricted into playing into a small part of the pitch and just hoping that somebody can beat an opponent with a dribble to get anywhere. Admittedly, they do have an ideal player to be at the top. A strong target who can take the ball to feet and roll defenders. But just look at what it has done to the space! It’s this use of depth that ultimately made the difference between the two sides on the day. (B) A Glorious Disguised Shot! There were plenty of decent strikes, but the one that NEEDS a mention the most was on the 6 minute mark of the video. This no-look curler into the bottom corner is absolute poetry! Not everyone can pull off a shot like that, especially with the amount of disguise that was on it. It’s hit from a distance, but the keeper doesn’t have a line-of-sight on the ball and by the time he sees it, it’s already whipping into the bottom corner. Curlers like these aren’t easy to pull off, but when they do, they’re sensational! This game had two very different goalkeepers, both excellent. What they had in common though, was top-notch blocking ability. 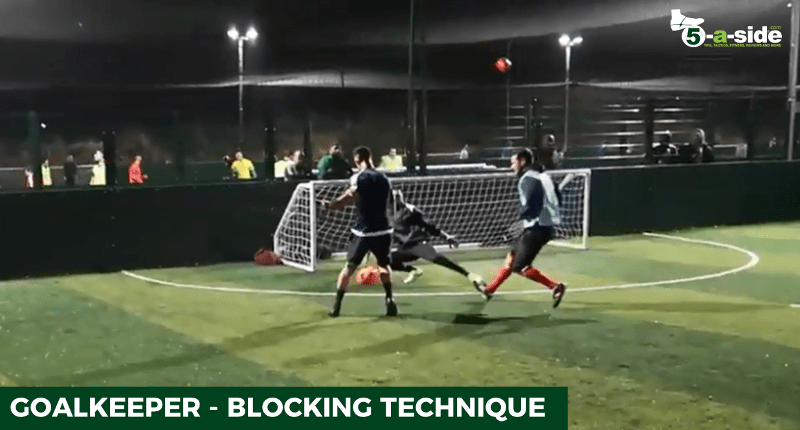 As we’ve covered before in 5-a-side, a lot of the saves that a goalkeeper makes are blocking – i.e. just getting your body in the way – rather than making diving saves. To do this well, the keeper’s positioning has to be excellent. They need to be alert and ALWAYS come out as far as the area will allow in 1-on-1 scenarios, in order to cover as much of the wide goal as possible. He’s got a lot of flexibility in his trailing leg, which allows him to cover the low right corner, whilst still charging down the shot, leaving the striker very little of the goal to aim at. Had the keeper stayed on his line instead, as a lot of less clued-up players might, he would certainly have conceded a goal. In this case he made the save.